"It is unavoidable in Rome to look at ancient history as well as to the Renaissance period. I was personally very drawn to the grandiosity and richness of the antique places..."
Giunto alla suo terzo ciclo, Conversation Piece | Part 3 – curate da Marcello Smarelli e dedicate agli artisti italiani e stranieri presenti per un periodo a Roma – vede la partecipazione di Jonathan Baldock, Piero Golia, Magali Reus, Claudia Weiser. La Fondazione Memmo si fa promotrice di un progetto che ha l’obbiettivo di esplorare la scena artistica contemporanea di Roma, creando un vivace circuito di scambi e corrispondenze tra gallerie, fondazioni, accademie e istituti di cultura stranieri. Come per le precedenti edizioni, anche per Conversation Piece | Part 3, gli artisti si sono confrontati con un tema specifico: la natura degli oggetti e come li utilizzano nella loro pratica artistica. Cubismo, Dadaismo, Surrealismo, New Dada, passando per la Pop Art, il Minimalismo, l’Arte Concettuale … per giungere ai giorni nostri, gli oggetti sono stati uno snodo concettuale alla base delle ricerche di molti artisti. “Si tratta di quel principio di defamiliarizzazione dell’oggetto riproposto da Jasper Johns nei primi anni sessanta con l’affermazione: “Take an object / Do something to it / Do something else to it” (“Prendi un oggetto, facci qualcosa, facci qualcosa di diverso”), che diede vita ad un fenomeno che diverrà il leitmotiv di un’intera generazione di artisti e critici. L’uso di oggetti mutuati direttamente dalla realtà riapre una questione sempre attuale nel dibattito sul contemporaneo, rivitalizzata dal filosofo Arthur Danto nel 1964 quando, visitando la mostra in cui Andy Warhol esponeva per la prima volta la serie delle Brillo Boxes, concluse che l’arte aveva ormai raggiunto il punto massimo di autocoscienza, in quanto l’opera non era più distinguibile da un prodotto commerciale: qualsiasi oggetto può essere un’opera d’arte, anche se non ogni opera è separabile dal suo tempo e il suo “valore” non dipende esclusivamente da proprietà intrinseche o osservabili. Claudia Wieser: A Roma è inevitabile non soffermarsi sulla storia antica e sul periodo del Rinascimento. Personalmente sono sempre stato attratta dalla grandiosità e ricchezza dei luoghi antichi, anche prima di venire a Roma. Certamente è stato un grande piacere aver avuto la possibilità di trascorrere più tempo in alcuni luoghi di un normale turista, e aver avuto anche la possibilità di tornarci. Ho sempre trovato molto interessanti la struttura dello stato e l’organizzazione dell’impero romano, così come la produzione culturale. Non posso dire che questi elementi mi abbiano direttamente influenzato nel fare arte, anche perché serve tempo per ambientarsi, ma è stato un grande arricchimento l’essere circondato da questa incredibile ricchezza storica. E dalla cordialità dei romani. CW: Ho deciso, di comune accordo con i curatori, di esporre un gruppo eterogeneo di opere, che include stampe digitali per carte da parati, sculture lignee, sculture applicate su piastrelle in ceramica e lavori su specchio che, insieme, creano un ambiente particolare. Molto raramente concepisco una singola opera d’arte, cerco piuttosto di creare un dialogo tra lo spazio, i lavori e il visitatore. I lavori che ho scelto per Conversation Piece / Part 3 favoriscono questo dialogo. Sono perlopiù lavori basati sugli oggetti, e anche i materiali usati sono decisamente quotidiani, come appunto specchi, piastrelle, rame e carta da parati. CW: Venendo dall’artigianato e lavorando come scenografa per il cinema, prima di cominciare a fare arte, ho sempre sentito una forte legame con gli oggetti. Specialmente nell’universo della scenografia cinematografica, dove vengono creati dei mondi finti, che esistono soltanto di fronte alla telecamera, dove gli oggetti non hanno funzioni reali al di là di quella narrativa e al loro contributo alla creazione di un’atmosfera particolare, la dimensione oggettuale è molto importante. Sono stato molto influenzata da tutto questo nei miei lavori più recenti. Il mio lavoro è spesso creato in bilico su una linea sottile tra design e arte, decorazione e arte, funzione e arte. Non prendo oggetti quotidiani per trasformarli in opere d’arte – piuttosto creo oggetti che sono opere d’arte ma che suggeriscono la possibilità di avere una seconda chiave di lettura – come un mobile, un vaso, una carta da parati ecc. Sono anche fondamentalmente interessata alle informazioni ulteriori che ogni oggetto ci fornisce – in termini di storia, funzione, atmosfera, forma, uso ecc. Questo determina spesso il primissimo punto di partenza di un’opera d’arte, per cui un oggetto di design scatena per un momento la visione artistica. La natura, per contro, che io amo moltissimo, è totalmente in opposizione a questo fenomeno, perché non mi ispira minimamente. The project was conceived with the aim of continually reviewing the contemporary art scene in Rome which is difficult to understand for the general public, but is a surprisingly active panorama dominated by the continuous activity of galleries, foundations, Academies and foreign cultural institutes where new generations of artists from all over the world, traditionally complete their education. Through these exhibitions and other activities, such us talk, workshops and performances, the Fondazione Memmo aims to support these institutions, which are considered vital in the maintenance and development of the contemporary visual arts and culture in Rome. As for the previous editions, also for Conversation Piece | Part 3 artists have been asked to reflect on a specific suggestion, linked to the nature of objects and their specific use in the artistic practice. «Perhaps the immobility of the things that surround us – noted Marcel Proust – is forced upon them by our conviction that they are themselves, and not anythings else, and by the immobility of our conception of them», so if we would approach things from other points of view, we should learn different and new answers that would otherwise remain unknown. This is one of the main themes of the most radical avant-garde movements of the twentieth century, such as Cubism, Dadaism, Surrealism, up to the end of the fifties to the New Dada, actually based on a new interest in the everyday object that the junk culture, revived through a process of détournement, leaving this interest as an inheritance to the movements born soon after: Pop Art, Minimalism, Conceptual Art. It is about that principle of defamiliarization of an object proposed again by Jasper Johns in the early sixties with the statement: “Take an object / Do something to it / Do something else to it”, that gave birth to a phenomenon that will be the leitmotiv of an entire generation of artists and critics. The use of items borrowed directly from the everyday life reopens an ever-present issue within the discussion on the contemporary, revitalized by philosopher Arthur Danto in 1964 when, visiting the exhibition where Andy Warhol was exhibiting for the first time the series of Brillo Boxes, concluded that arts have –by that time- reached the maximum point of self-consciousness, because the work of art was no longer distinguishable from a commercial product: any object can be a work of art, even if not every work is separable from its time and if its “value” does not exclusively depend on the intrinsic or observables properties. 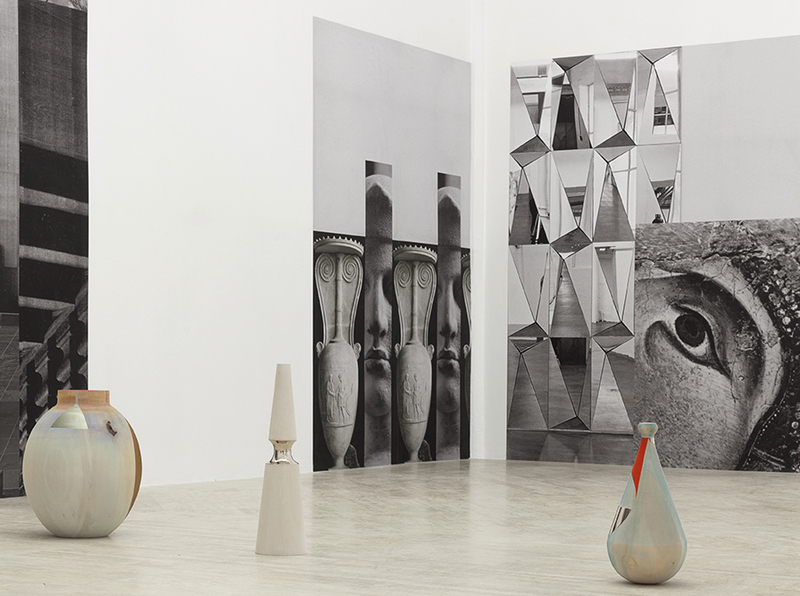 Claudia Wieser: It is unavoidable in Rome to look at ancient history as well as to the Renaissance period. I was personally very drawn to the grandiosity and richness of the antique places even before I came to Rome. Of course it was a great pleasure to be able to spend more time than a normal tourist at some venues and being even able to come back. The structure of state and organisation of the Roman Empire I find really fascinating, as well as the cultural output. I can´t say that it directly influenced me in making art, also that takes a while to settle, but it was a real enrichment to be surrounded by this incredible richness of history. And the friendliness of the Roman people. CW: I decided in accordance to the curators to show a heterogenous group of artworks, including digital prints for wallpapering, wooden sculptures, sculptures applied with ceramic tiles and mirror works which together built a special environment. I very rarely think in single artworks I rather try to create different dialogues between the space, the works and the viewer. The works I have choosen for Conversation Piece / Part 3 helped establishing this dialogue. They were mainly object based and the used materials turned up to be well known in daily life like mirror, tiles, copper and wallpaper. ATP: Regarding the subtitle of Conversation Piece | Part 3 – “Take an object / Do something to it / Do something else to it” (Jasper Johns) -, which is your relationship with daily objects? How much do they affect your research? CW: Coming from craftsmanship and working as a set designer for film productions before I started to make art I feel a strong relation to objects. Especially in making movie designs where a fake world is created and existing only in front of the camera lense, where objects have no real function outside the narrative and their contribution to a special atmosphere I got very much influenced for my later artwork. My work is often created in a way to balance on a thin line between design and art, decoration and art, function and art. I am not taking daily objects and transform them into an artwork – it is more that I create an object which is an artwork but suggests at the same time that it could have a second layer – being something else like furniture, a vase, a wallpaper etc. I am also interested in the additional information basically every objects gives us – in terms of history, function, atmosphere, shape, use etc.  This very first undefined starting point of an artwork where you just have a first little moment of a vision is often triggered by a designed object. Nature, which I really enjoy, is in total opposition to that phenomenon, because it doesn’t inspire me at all. 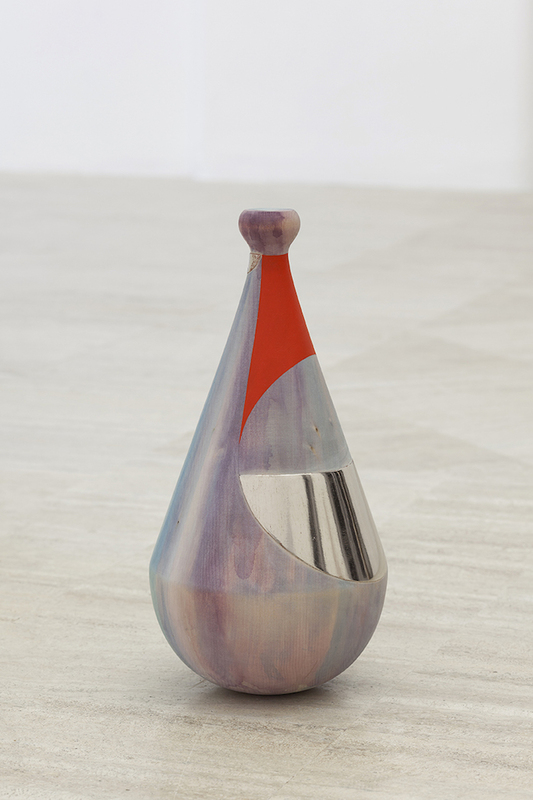 CLAUDIA WIESER (b. 1973, Freilassing, Germany). Solo exhibitions (selection): Studio SALES di Norberto Ruggeri, Rome (upcoming); All That Is, Arratia Beer, Berlin (2015); Lafayette, FIAC Paris (2015); Container, Sies+Höke, Düsseldorf (2014); Galeria Casado Santapau, Madrid (2014); The Mirror, Marianne Boesky Gallery, NY (2013); Galerie Kamm, Berlin (2013); Wallwork # 8, L40, Berlin (2012). Group exhibitions (selection): Tantra Drawings: sites of transformation, Drawing Room, London (2016); Das Moment, Neue Galerie Gladbeck (2016); Homebase – vom Interieur in der Gegenwartskunst, Kai 10, Düsseldorf (exh.cat.) (2016); Thinking Tantra, Jhaveri Contemporary Mumbai, India (2016); Passing Leap, Hauser+Wirth, NY; Wo ist Hier? Malerei und Gegenwart, Kunstverein Reutlingen (2014); Brigadoon, La Tolerie, Clermont-Ferrand, France (2013); Pathfinder Part III, Moins Un, Paris (2013); Prix Canson Nominees, Petit Palais Paris; Goldrausch, Villa Merkel, Esslingen (exh.cat.) (2013). 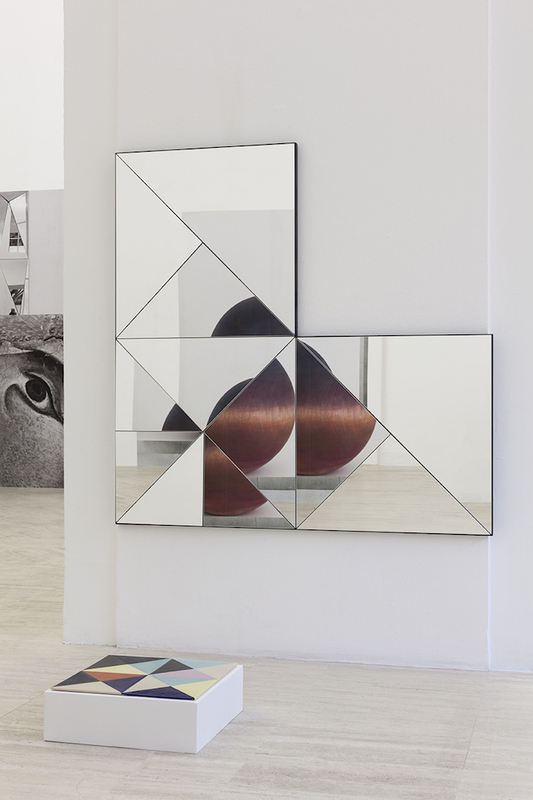 Claudia Wieser is currently in residence at Casa Baldi/ Villa Massimo, Rome.